The Göttingen Campus Council (GCC, established in 2006) is the main governing body for the Göttingen Campus. It represents the interests of all Campus members, develops joint strategic directions for the Göttingen Campus and ensures standards and quality. It identifies Campus-wide priority research areas, supports and encourages collaborative work in research and teaching, and is committed to delivering the best possible training to young academics. 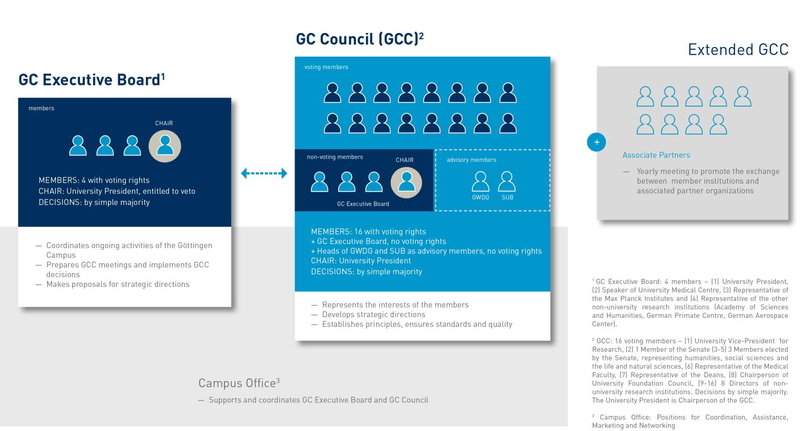 The GC Executive Board is responsible for the preparation of the GCC meetings and the implementation of measures in accordance with the decisions and guidelines established by the GCC.